For everyday causes of lower back pain, standard at-home pain management is a reasonable approach. 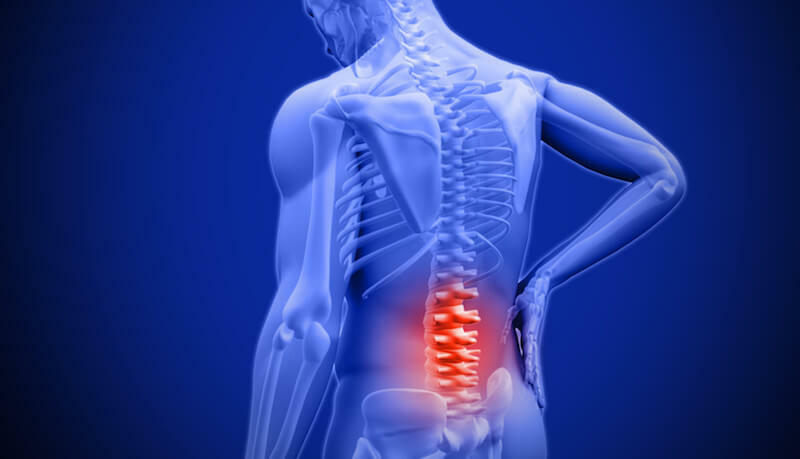 In fact, most cases of lower back pain are caused by a muscle strain and will get better relatively quickly and do not require treatment from a medical professional. If pain has lasted longer than one to two weeks or begins to interfere with one’s mobility and daily activities, or if there are troubling symptoms, seeking care from a medical professional is recommended. In most cases, back pain is caused by a simple muscle strain and can be managed by the individual through common self-care practices. A short period of rest, limited to one or two days, in which strenuous activity is minimized and excess pressure is kept off the spine. Sitting in a reclined position, with the legs supported and elevated (such as in recliner, or in bed supported by cushions) is typically a comfortable position that minimizes stress on the lower back. Over-the-counter pain medication, including NSAIDs (such as ibuprofen, naproxen, or aspirin) or acetaminophen. Popular brand names include Tylenol, Advil, and Aleve. Application of ice or a cold pack to the lower back to decrease local inflammation, which often accompanies back pain as a response to injury. Ice is typically recommended within the first 48 hours of the onset of pain. It is important to avoid direct application of ice to the skin (to avoid ice burn). Application of heat to ease muscle tension, relieve muscle spasms, and increase oxygenated blood flow to the area to facilitate healing. Most of the time, heat works best when used after the first 48 hours of back pain. Small adjustments to posture or daily activities that take pressure off the spine. For example, move carefully and/or with assistance from a sitting to a standing position, and take frequent short walks, as tolerated, to maintain healthy blood flow and reduce stiffness. After a short rest period, it is recommended that patients stay active, as too much rest can add to stiffness and discomfort. Stretches that mobilize the spine’s joints and gently stretch back muscles can help the patient return to normal daily function. The sooner a patient can return to everyday activity, the sooner low back pain is likely to alleviate. Regular physical activity is necessary even during an episode of back pain, as exercise helps maintain muscle strength and joint function. Regular exercise also encourages the healing process by increasing oxygen and nutrient-rich blood flow to the spine. Exercise walking or walking briskly enough to elevate the heart rate for between 30 and 40 minutes. Walking can serve as a good starting point for someone looking to improve their physical health, and it is versatile enough to be done anywhere the patient is comfortable—on the track or treadmill at a local gym, around the neighborhood, or at a shopping mall. For many with lower back pain it is a good idea to start with shorter walks and gradually, over a period of weeks, build up to walking for 30 minutes or more at a time. If walking is too painful or makes pain worse, water therapy may be a good alternative. The buoyancy of the water helps to support the patient’s weight in a more controlled manner, allowing for adequate exercise without putting as much pressure on the spine. Other low-impact aerobics include the use of stationary bicycles or elliptical machines. Finding an effective exercise that does not exacerbate pain may be a process of trial and error and is typically up to the preference of the patient.